When I was new to Linux Ubuntu, I used to worry about dual-booting Windows with Ubuntu could mess up my hard drive partitions and Windows boot loader. 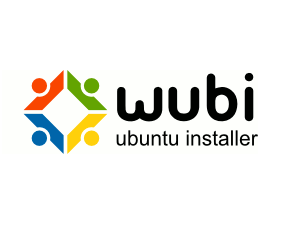 Good news is that Ubuntu merges Wubi, a Ubuntu installer for Windows to encourages new users get a taste of Linux Ubuntu eliminating the risk formatting or partitioning mistakes. Removing the Wubi Ubuntu is very easy too by uninstalling Ubuntu just like how we uninstall other Windows software as usual in Control Panel. Download Ubuntu Linux .iso image file. Mount the Ubuntu .iso file in Windows. I use Virtual CloneDrive which allows you to mount all common image files like ISO, BIN, CCD. 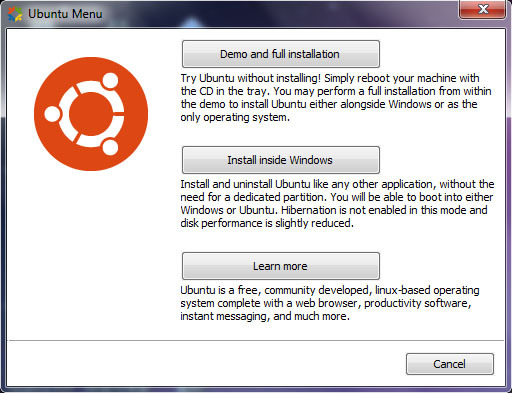 Click Install inside Windows to install Ubuntu like any other Windows application. 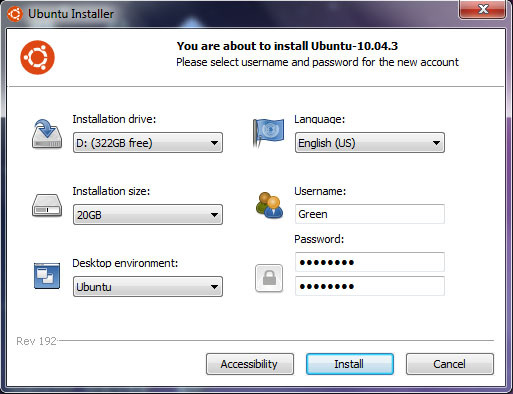 Customize to your preferred install settings, enter Username and Password for Ubuntu. When you done, click Install. When the installation is complete, choose Reboot now and click Finish to complete the Wubi installation. 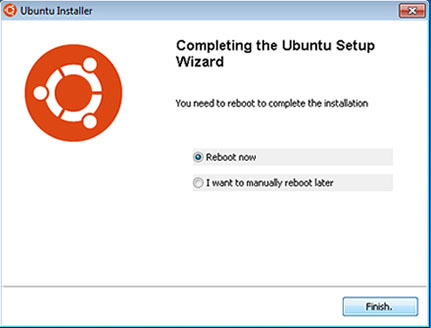 After your computer restarts, select Ubuntu. Your computer will boot into Ubuntu and another Installation will starts. Just wait it to complete and restart computer again. Done without bothering the partitions and formats. 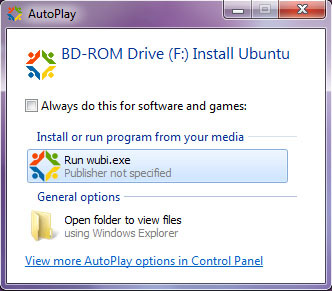 Installing Wubi Ubuntu is rather easy but if someday the Windows crash, you will also unable to boot into Ubuntu. Hibernation is not supported and disk performance is slightly slower too.